This salmon steak recipe can either be baked or steamed and is best served with a vegetable side, such as asparagus or broccoli. Steaming requires thorough and immediate immersion into hot mist. Begin with the pot full of steam. The steaming vessel needs to be high and wide so that steam can circulate around the food. Since food doesn't contact any other medium when steamed, flavors are accentuated; therefore, using fish of fine quality is important. Keep cooking times as short as possible. Don't cook the soul out of the fish. With salmon, the fat content of the flesh is considered the indicator of table quality and flavor, much as with beef steak – with higher fat content being better. With fish, fat content is related to how far the fish have to swim in their annual breeding cycle. 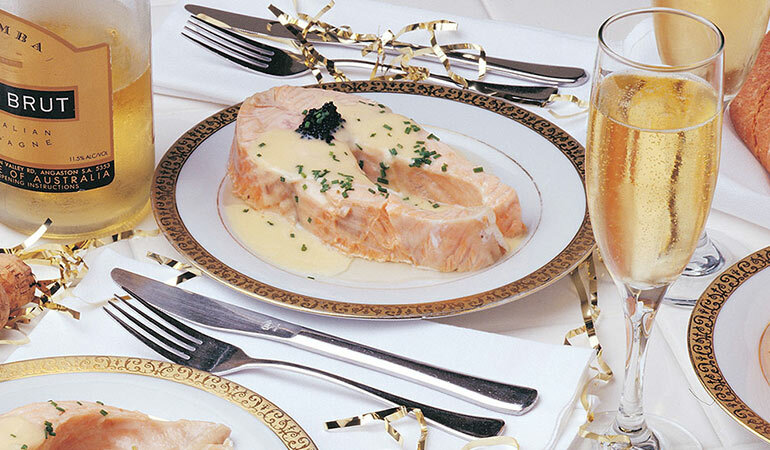 Alaskan Copper River salmon are one of the most famous and delicious salmon, because the Copper River with its tributaries is one of the longest river systems in Alaska. So, if you can track down some Alaskan Copper River salmon for this delicious recipe, I'd recommend you do. In a heavy pot with a steaming platform and a tight lid, bring the water, vegetables and herbs to a boil. Bring the Chardonnay, vinegar, shallots, vanilla bean, salt and pepper to a boil and reduce to 2 ½ tablespoons. Strain and return the reduced mixture to a heavy pot. Over low heat, slowly whisk in 8 ounces of cold butter one ounce at a time, whisking constantly until the mixture is smooth and emulsified. Season with salt and pepper. Place the fish on a serving plate, spoon the sauce over the steaks and garnish with lemon or chopped fresh parsley.